(Steven Ertelt – LifeNews) The harassment of and violence against pro-life conservatives continues. This time, in Washington state, a man whose truck had bumper stickers supporting President Donald Trump arrived to his vehicle after parking it overnight in a parking garage only to discover it had been firebombed. 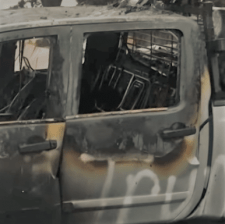 The owner believes it was purposefully targeted because he had the pro-Trump stickers and because the arsonists responsible spraypainted the word “Trump” in white letters on the side of the vehicle. Johnny MacKay reportedly left his vehicle in the parking lot of the Garage Bar and Grille and took alternate transportation home after consuming alcohol at the establishment. When he came back for his truck on Monday, it looked like it had hit a land mine.